Need Holiday Shopping Ideas? Check Out Our New Online Spirit Shop! Did you know the PTO spirit wear committee also has tote bags, coffee mugs and more available for purchase? Did you also know that these items are available in our new online spirit shop? Purchase these items and some other clearance apparel items online! You can buy with a credit card or PayPal account and have it delivered via your child. It’s as simple as that! A design by Dan Mills’ parent, Craig Allen! We had 15 design submissions overall, so thank you to everyone who submitted a design. We had so many great submissions! Once designs were gathered, they were taken around to each classroom and voted on by the students. The kids had so much fun voting and it was a great uniting exercise for them to have a hand in their next t-shirt design. New house shirts are now being sold with the winning design. Order forms went home yesterday (Friday, October 5). Make sure to send those back in by the deadline to get your new spirit wear. Congratulations again to Craig Allen for having the winning design! Where Do We Spend Your PTO Dollars? We had an awesome first PTO Live! meeting on Tuesday - more than 60 people attended. Including some watching our very first Facebook Live broadcast! "Mindfulness kits" were purchased as requested by our school counselor Mrs. Hoge. These kits are available in every classroom in a "Peace Corner" and contain items that students can use to help calm themselves down when necessary. We are working on plans to put in a half basketball court in the front lawn (if approved by MNPS). Yeah! The back playground will be getting mats to place under the swings. These will keep the mulch from being pushed out of the way and help the younger students be able to reach the swings. We are working on a plan to update and "bedazzle" the school library. Curriculum used by various grade levels was purchased for the school year - IXL, Star Math, Study Island, phonics curriculum, Accelerated Reader and more! We will continue to fund the House field trips - these trips are awarded to the winning house per semester. As always, we continue to fill teacher funding requests for various items and teaching tools that help our amazing teachers educate our students. Thank you to all our awesome parents that care so much about our school and help to make it great. If you missed it and want to watch, you can find our Facebook Live broadcast here. For all our PTO Live! meetings we will raffle off two days of NO SSA for your student(s). Two names will be drawn for anyone in attendance - either in person or online. Hope to see you at our next meeting on Tuesday, September 11, 5:30 pm at the Berkley Hill Apartments playground. Do You Have What It Takes To Design Our Next Dan Mills T-Shirt? Parents! If you're a graphic designer or artist, your design could be the next spirit wear shirt! 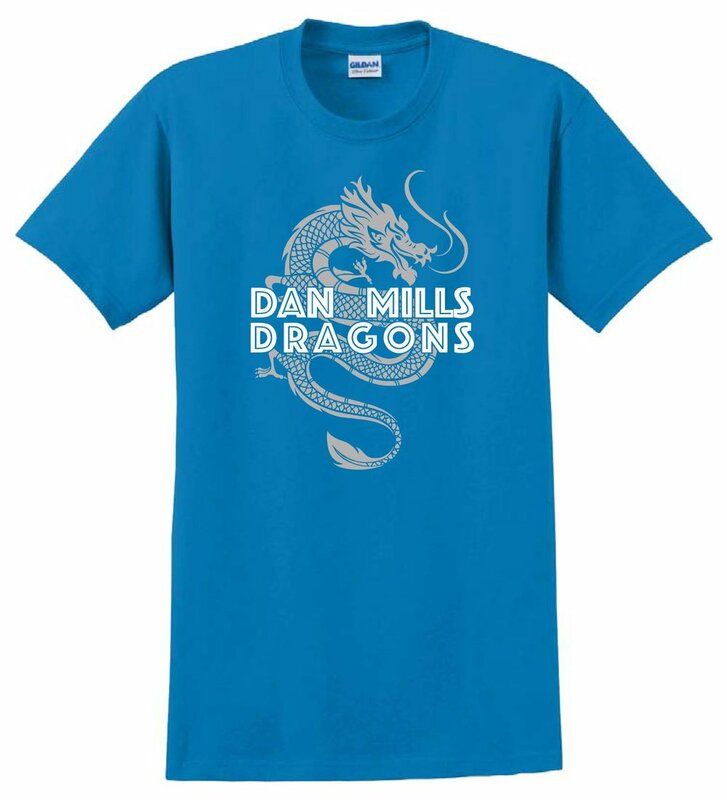 Send us your best Dan Mills Dragons design. All parent-submitted designs will be considered by the PTO and voted on by students. How cool is that?!? Email your artwork (preferably in a vector file) to ptodanmills@gmail.com by September 1st! Thank You For An Awesome 2017-18 School Year! Now that the dust has settled after end-of-school madness, we at the Dan Mills Elementary PTO want to say a big THANK YOU to the parents and community who have supported our school this past year. It has been an amazing one! With your help and support we achieved every goal we had in fundraising this year, and then some! We hosted four fundraisers this year - Songwriters in the Round, Dragon Dash, Dragon Jubilee and Spring Auction - raising a net of more than $50,000!! Wow. This is because of YOU, and your school thanks you. If you wonder what we did with some of that money, take a look below and see the things YOU helped fund. The annual Dan Mills' Spring Auction and Art Show night is upon us this week! We thought we'd share a few tips with you so you can have an easy and enjoyable evening. 1. Pre-Register for a Bidder Number. You can register at the event the evening of the auction, but there will also be a line. Take less than a minute to pre-register for your bidder number now, and you’ll have everything you need to walk into the auction and start bidding on the items you want! Lots of volunteers are needed to help run a successful auction. So please consider signing up for just a short shift. Volunteering is a way to give back to Dan Mills, and your time is greatly appreciated. Sign up to volunteer here! D’s & J BBQ, Steaming Goat and That’s My Dawg food trucks will be open in the front drive starting at 4:30. The bake sale team will also have goodies for sale in the cafeteria. 4. Pay for your item and take it home when the auction ends. Checkout tables will be set up to make checkout easy and quick! By paying for and taking home your winnings at the close of the auction, it will prevent you from having to come in later to claim your item. 5. Sign up for Venmo if you haven’t already. Winners will be able to pay with cash, check, Venmo, or credit card. Cash, check and Venmo will be the fastest ways to pay. There are no fees that are charged through Venmo…so that’ll ultimately be more money that goes back to Dan Mills. There will be lots of great items at this year’s auction! Know that your money will be used to help fund enhanced school safety and to compensate for budget cuts, so bid enthusiastically on something that you’ll enjoy! What Is It About All This Spring Auction Talk? No doubt you're aware that our annual Dan Mills' Spring Auction and Art Show is coming up NEXT WEEK, Thursday, April 19. (And if you don't know what I'm talking about, let me help you out and direct you to our webpage on it here.) So the question to answer for you now is "why should you care?" Check out the gallery below for a preview of some of the items to be auctioned. And don't forget! We're using bidder numbers this year to streamline the bidding and checkout process. Bidder numbers can be obtained by getting a FREE ticket. You only need one ticket per family. Pre-register today to get your FREE ticket! Be principal for a day! YMCA Gift Certificate for membership, classes, etc. You can make an entire evening out of this event ... there'll be food trucks for dinner (starting at 4:30pm), 1st & 2nd grade musical performances and the annual art show where all the students' artwork from the year will be on display throughout the school. More details on the event, including the schedule and volunteer opportunities, can be found on our Spring Auction webpage. Here at Dan Mills we feel strongly about honoring ALL the people who help our school run smoothly ... and our crossing guard, Ms. Sonya, is no exception! Dan Mills' parent, Elizabeth Sullivan, spearheaded an effort to collect money from parents and gift something to our steadfast crossing guard for Crossing Guard Appreciation. And boy did you all come through! We were able to raise more than $500!! Families gifted Ms. Sonya with a beautiful, homemade card and a gift card in the amount raised. She was very grateful for the surprise gift. And we are so glad we could show a tiny bit of appreciation for all that our crossing guard does every school morning and afternoon. 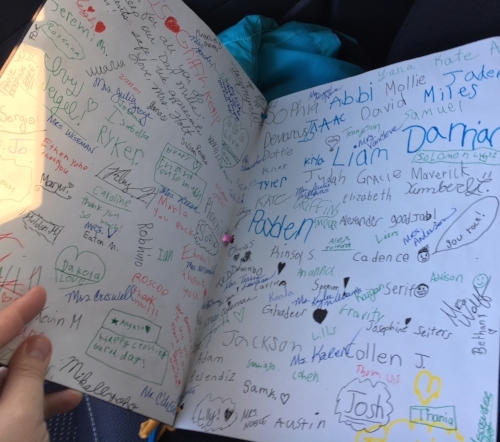 Thank you to all the parents who contributed money, the students who signed the card and Ms. Holt and the art department for designing the card. As most of you have probably already heard, MNPS has proposed an adjustment in the budget and allocation of funds to individual schools for the 2018-19 school year. The district has also immediately instituted a hiring, travel and purchasing freeze at schools in light of a $7.5 million shortfall for the year. I'm not here to discuss the ins and outs of MNPS budgeting, though you may read about it on The Tennessean here: "How the upcoming Nashville public schools budget proposal will impact your child's school" and "Nashville school board members call for a review of expenditures in light of $7.5 million shortfall." 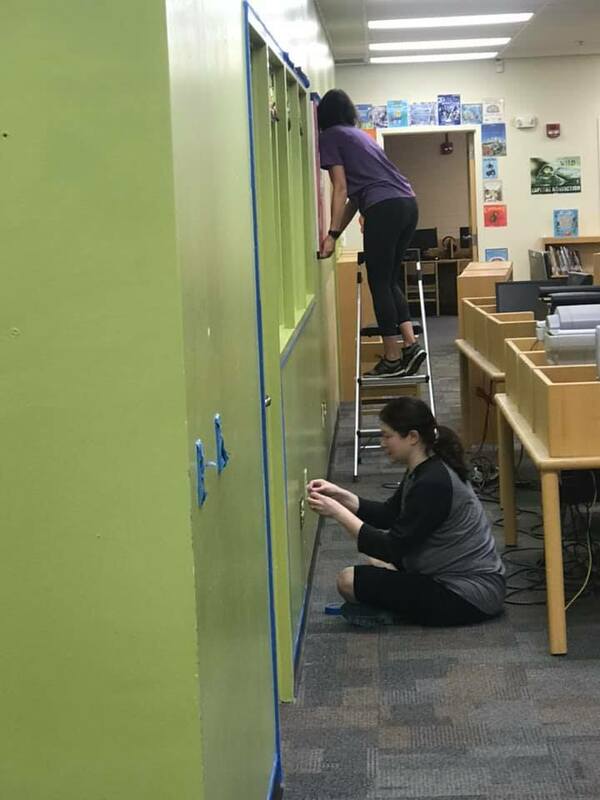 Dan Mills' PTO is dedicated to supporting our school in whatever way possible so that our students, teachers and administration can thrive. So here are some things you, the parents of Dan Mills, can do to help our school. Reach out to your child's teacher and ask if there's anything they need in the classroom to get through to the end of the year. Volunteer in the classroom. Talk to your child's teacher and see if they have tasks they need help completing. Get involved with the PTO. Gift your child's teacher with an Amazon gift card or another gift card to a school supply store. Attend our PTO Live! meetings to see where else you can plug in. Tell your teachers "thank you." Donate to the PTO - contact us if you'd like to. The funds collected by the PTO directly go back to the school to fund such things as increased security measures, computers, teacher supplies, literacy kits, teacher requests, and all kinds of other things. Have more ideas? Share them in the comments! You Got It? We'll Take It!! A Call For Auction Items. Do you own a business? Do you provide a service? Do you have a talent? Do you know someone else who has any of these? Do you have access to cool people - artists, musicians, etc.? Do you not have any inhibitions and can ask people for anything? If you answered yes to any of the the above, then by golly tell us! The PTO is still collecting auction items for our Annual Spring Auction. It can be a gift card to a restaurant, teaching guitar lessons, providing electrical work, really cool memorabilia (you know, for anyone who is tied to the music business ... wink, wink), babysitting services, or anything you can think of that people might want. We also need volunteers who can go door to door to local businesses and ask for donations. We're determined to make this auction the best one yet! Proceeds from this fundraiser will hopefully go towards security measures AND help offset yet more budget cuts at Dan Mills. If you have items to donate to the auction or want to help solicit more auction items, contact Jen McCarter. East Nashville Chiropractic Donates to Dan Mills PTO! In December East Nashville Chiropractic, owned by Dan Mills' parent Kathleen Inman, set a goal of raising $1,000 for Dan Mills Elementary. Well, they met that goal!! At Tuesday's PTO Live! meeting Kathleen presented us with a check for $1,000. Thank you East Nashville Chiropractic! It is because of local businesses like you and the great parents we have that we've been able to build a fantastic PTO to support our wonderful school! Snackin' USA Fundraiser - Principal Yates sent a letter home about this one. It was a fundraiser secured at the beginning of the school year by the main office to help offset budget cuts. A portion of the proceeds will benefit Dan Mills Elementary. Deadline for orders is TOMORROW, February 7. St. Jude Math-A-Thon - This is a fundraiser for St. Jude Children's Hospital. School contact is Mr. Edwards and deadline for donations is this Friday, February 9. Jump Rope for Heart - This is a fundraiser for the American Heart Association. School contact is Ms. Willliams. There will be a school-wide event on Valentine's Day, February 14, and fundraising ends on Friday, February 16. Hope this helps clear some things up for everyone.